The persistent problem of overripe bananas in my house during summer, makes me think about all the possibilities of using these black spotted fruit without trashing them. Without much pondering, my thoughts settled on breakfast bread. When hubby suggested to make the banana bread with Maple syrup, I was like 'I had already blogged about it, need to come up with something else :), then he was like OK experiment on us!!!! So I thought of revamping one of the old recipes I had in my folder with few changes and the end result was a yummy loaf of bread. I believe it was last summer, I experimented with some cherries in bread and those came out very good. I had some overripe cherries sitting in my refrigerator over a week. It was an easy pick to use the overripe fruits and whip up something quick for the next day's breakfast. Since the cherries were little over ripe you will notice the color change in the bread, it looked more like blueberries after the bread was done. I made this loaf a week ago, but never got a chance to sit down and write the recipe. TGIF, what a relief, don't have to think about work for 2 days...want to sit back, relax and watch a movie with my family!!!! Sift together the wheat flour, salt, baking soda and baking powder and keep it aside. Using an electric stand mixture, mix all the wet ingredients. Add the rolled oat and mix for 20 seconds. Now add the wheat flour, salt, baking soda and baking powder. Fold in the 1 tsp of flax seeds, grated coconut and cherries. Pour into greased or parchment paper lined loaf pan. Sprinkle the rolled oats and flax seeds over the batter evenly. Drizzle 1 tbsp of honey over the topping and bake for 50-55 minutes till a tooth pick comes out clean when tested at the center of the bread. Tranfer to a wire rack and cool completely before cutting it. Store the bread in air tight container in the refrigerator. It's so odd, but we rarely have overripe bananas - we eat them too quickly. Of course we never buy that many at a time, so there's that. Anyway, lovely bread. I've not made a bread with cherries for ages and ages - and your recipe looks quite nice. Good stuff - thanks. Hope you saw a terrific movie! 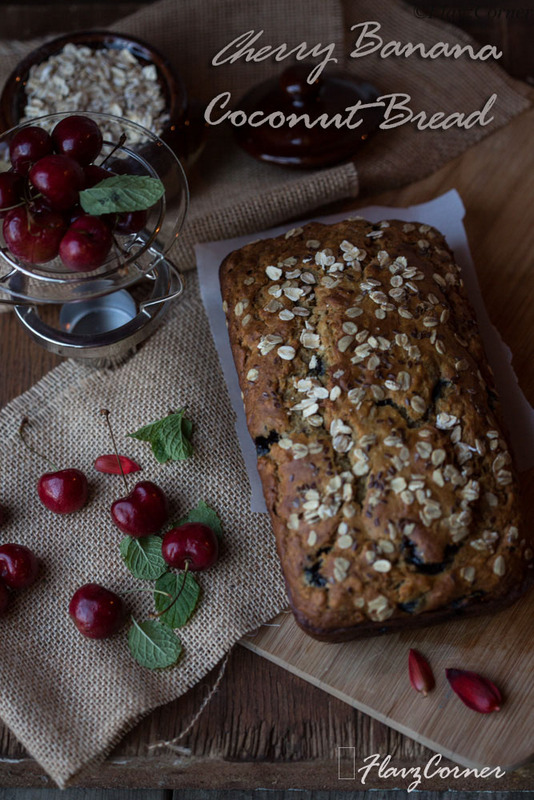 We love banana bread and I make it often, but never tried with cherries before. 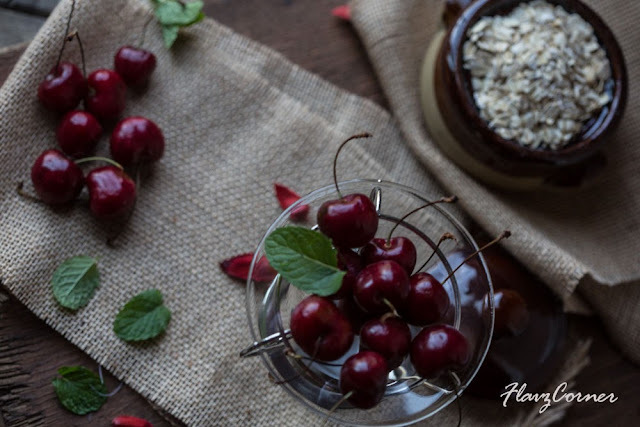 Cherries are still in season and sounds like a great combination, Shibi! Never tried cherries in banana bread, very interesting. I love that you've added coconut and all good stuff. Pinning it for sure..
Nice to meet you Shibi.. So yum! 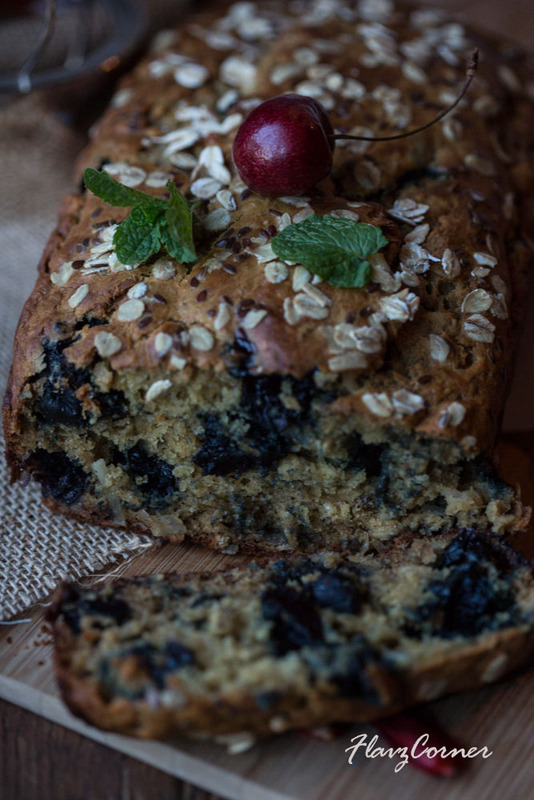 I love the cherries and banana combo in this bread!